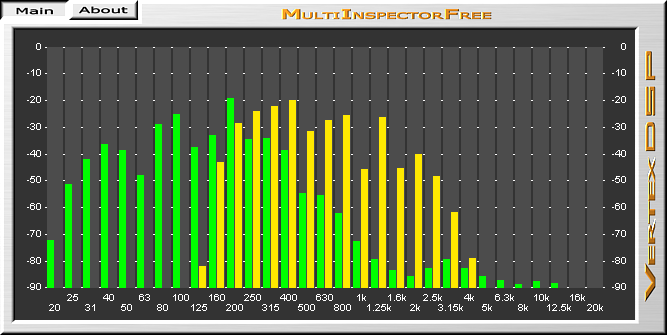 Test features of MultiInspector with MultiInspectorFree. I developed MultiInspectorFree for long studio-sessions to assist your ears. 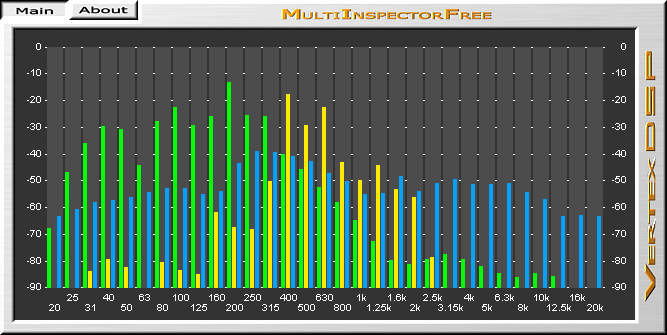 MultiInspectorFree visualizes up to 4 different audio signals in real time in one window (for up to 16 audio signals see MultiInspector) and helps you to detect overlapping frequencies in your mix. 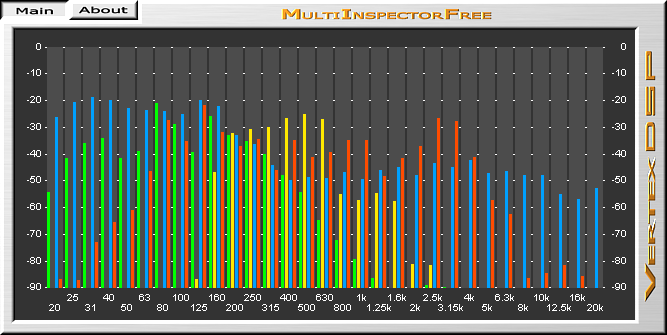 MultiInspectorFree is a 31 band spectral analyzer with multitrack functionality. It incorporates a standard third octave frequency analyzer. Center frequencies of the bands are based on the ISO 266:1997 standard (20 Hz to 20 kHz). Pink noise will appear flat in the frequency spectrum. 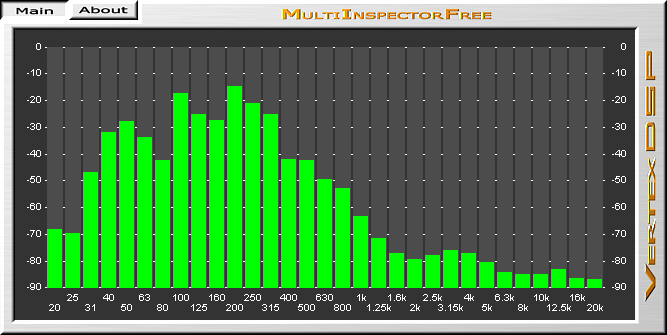 MultiInspectorFree supports up to 4 instances at a sample rate of 44.1 kHz. Width and the Color of the level bars are adjusted according to the current number of instances. Click for full size. VST 2.4 or AU compatible host software. Universal Binary, PowerPC and Intel supported. • Compatibility with the fxpansion VST-RTAS adapter. •	Improved window handling (AU version). •	The installer now removes all temporary files used during installation (Mac only). •	Keyboard focus of the host is now retained after clicking inside the editor window (Mac only). •	Compatibility issues with systems running Mac OS X 10.3. • Flickering display of the level bars under certain circumstances. • Incorrect assignments of levels in low frequency bands. • GUI update frequency increased for smooth attack/release behavior of the level bars. •	Improved accuracy of the level bars. •	The levels of the mono version had an offset of -6 dB. •	Memory leak fixed (Windows only).